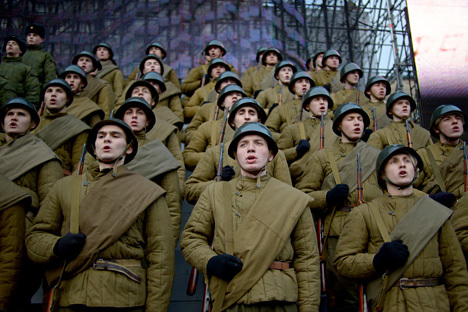 The huge size to which the Red Army had grown by 1941 meant that Soviet soldiers were issued field dress developed in the early 1900s as a cost-cutting measure. While lacking the frills of the 19th-century dress, their uniform was far more practical in combat – apart from the bright insignia worn by senior officers, a delight for German marksmen. When World War II engulfed the Soviet Union in 1941, Moscow had the largest army in Europe, with almost 2 million soldiers. The downside was the expense of re-clothing such numbers, so Soviet troops entered the conflict in dress developed under the tsarist generals in the early 1900s. At the outbreak of hostilities, Soviet uniforms comprised many of the same elements worn by Russian forces in the First World War, including a cotton tunic and pants, and boots with cloth windings because of leather shortages. The 1935-issue winter greatcoat was almost a duplicate of the 1912 design. But a noticeable difference was the enlisted troops’ preference for the forage cap to the peaked cap that had replaced the pointed felt budenovka cap before it. The new Soviet winter wear also included a cap with ear flaps. Red Army soldiers were issued with a full set of equipment, with belts made of leather or canvas, cartridge belts, main and supplementary pouches for grenades and food, an entrenching tool, water bottle, rifle fittings (bayonet and cleaning kits), and a steel helmet. But the war brought changes too. Bulky equipment stowed in several packs was too cumbersome for foot soldiers expected to cover up to 40 km (25 miles) in a day, so a waterproof duffel bag was introduced. The greatcoat and bedroll soldiers carried around their body also hampered mobility, and in August 1941 the order was give to issue a new cotton winter jacket that could be worn under a coat but gave good protection against the cold, and could be worn as a separate uniform item. In areas with severe winters, greatcoats were replaced by half-length fur coats. And instead of shoes and conventional boots in extreme weather, the forces got thick wool and felt valenki, traditional winter footwear worn for hundreds of years. Along with millions of men, thousands of women also now appeared at the front, including in combat units. This had been almost unheard of in the old Russian army, so there was no special uniform for them, requiring Soviet quartermasters to come up with a solution in quick time. In August 1941, a prototype women’s uniform was created, with a dress instead of a tunic, first made of cotton and then wool, and with a beret instead of a forage cap. It became clear in the first battles of the war that the uniform of Soviet officers and generals made them easy targets for enemy marksmen. Distinctive insignia and braid on their caps that was introduced shortly before the war singled them out from the lower ranks. Also in August 1941, the army command sent down orders to remove all uniform chevrons and bright stripes on pants, and to replace gold-colored lapel insignia with new-issue khaki equivalents. As well as the problem of bright markings, in the early years of the war Soviet uniform was produced in large quantities in non-standardized facilities, resulting in variations in patterns. In 1943, military dress underwent a major reform, the main innovation of which was the reintroduction of officer epaulettes, not worn since the 1917 Russian Revolution. They returned in khaki for field wear and were gold-colored for day-to-day wear. Rank was now denoted not with diamonds and squares on the lapels but by the number of stars on epaulettes. Higher-ranking officers also wore a gilded Soviet Union coat of arms on their shoulder-straps. The lower ranks were less affected by the reforms. Troops were issued with new shirts with stiff vertical collars rather than folded-over ones. Ankle boots with windings largely disappeared, and the army was issued longer kirza boots made of layered tarpaulin in place of leather and treated for water resistance. These were a boon for Soviet quartermasters struggling with leather shortages, and they were comfortable to wear for the soldiers, compared to heavy boots. Uniforms were now divided into parade, field and day-to-day wear variants. The field uniform was used in active service and combat, and the latter for drill service. Parade wear was only worn on ceremonial occasions. As well as epaulettes, officers regained their smart former imperial cut jackets. Other dress uniform elements that made a comeback included cuffs and gold and silver embroidery. The soldier’s dress uniform had red piping on the collar, cuffs and pockets, but remained unused for a long time yet. The ceremonial outfit was first worn by Soviet soldiers on June 24, 1945, at the Victory Parade in Moscow marking the defeat of Hitler’s Germany.